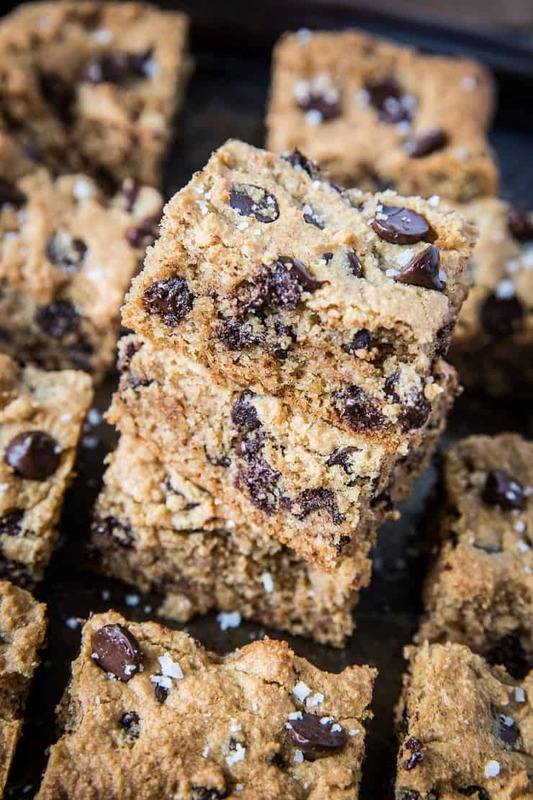 How to make a batch of paleo chocolate chip cookie bars disappear in 8 seconds flat? Stick them on a counter at Jiujitsu, mic drop, and walk away. 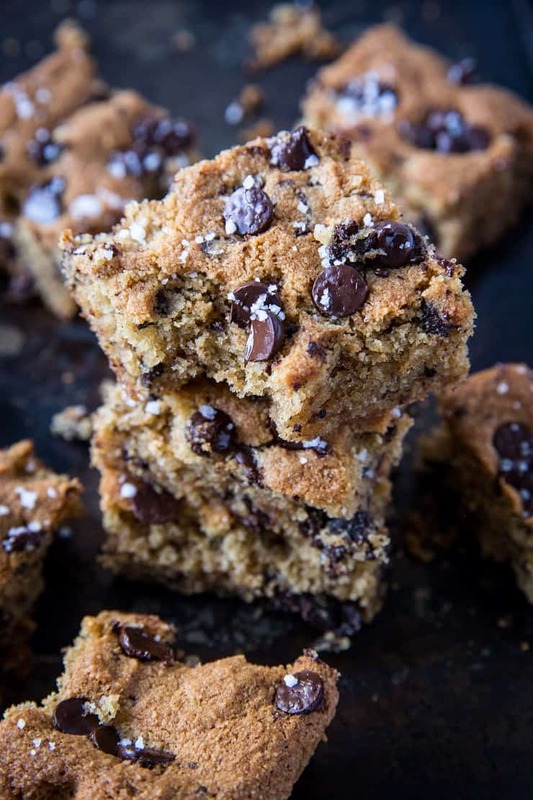 Just like the Paleo Gingerbread Muffins I showed you earlier this week, these cookie bars became an instant sensation at Momentum (where I do the Jiu Jitsu). If you need your heart to explode and melt into a puddle of unicorn sneezes, check out Robb Wolf’s post on Instagram of his daughters with the bars. Wrap it up, my work here is DONE! Many-a-child and adult taste tested these bars (I baked them twice for good measure) and the unanimous comment was: delicious. 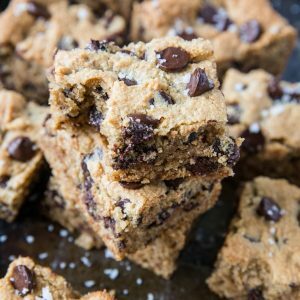 So here’s the low down on these bars: I took my Soft, Chewy, and Gooey Paleo Chocolate Chip Cookies recipe, tweaked it a bit, and turned it into bars. Or blondies, if you will. 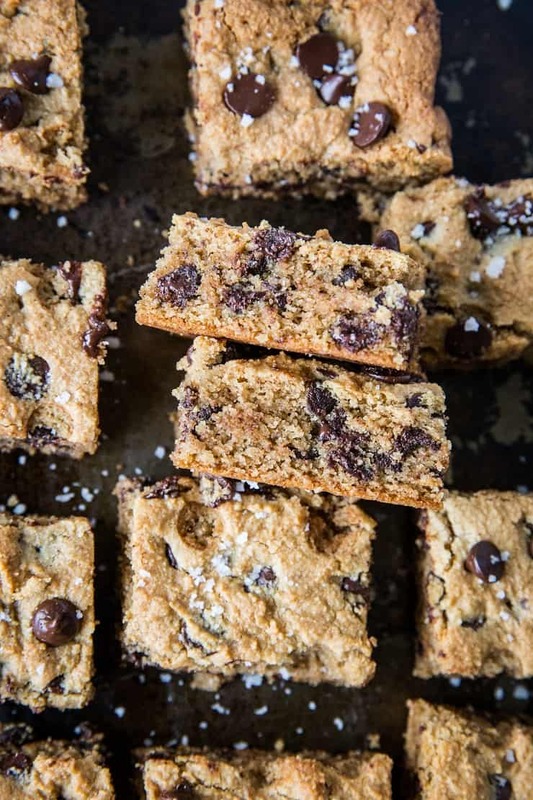 These bars are grain-free using almond flour, refined sugar-free with pure maple syrup, and lactose-free using ghee (you can also do coconut oil to make them entirely dairy-free), and a better-for-you option than your classic cookie. The texture on these bars is pretty epic. They have that nice crisp around the edge, the irresistible melty chocolate offset by sea salt for that hyperpalatable sweet-salty combo that keeps you coming back for more. In addition, the bars are nice and soft with a buttery flaky texture. When you sink your teeth in this cookie on steroids, you have the crisp exterior, the melty, gooey soft interior and it just hits all the bases. For ultra gooey cookie bars, you can under-bake these bars to bring the goo factor to the next level. If you go this route, you can scoop them into bowls and serve them up with ice cream, which in my opinion is a million times better than birthday cake. If you’re baking holiday treats for gifting to friends, family, co-workers, etc. 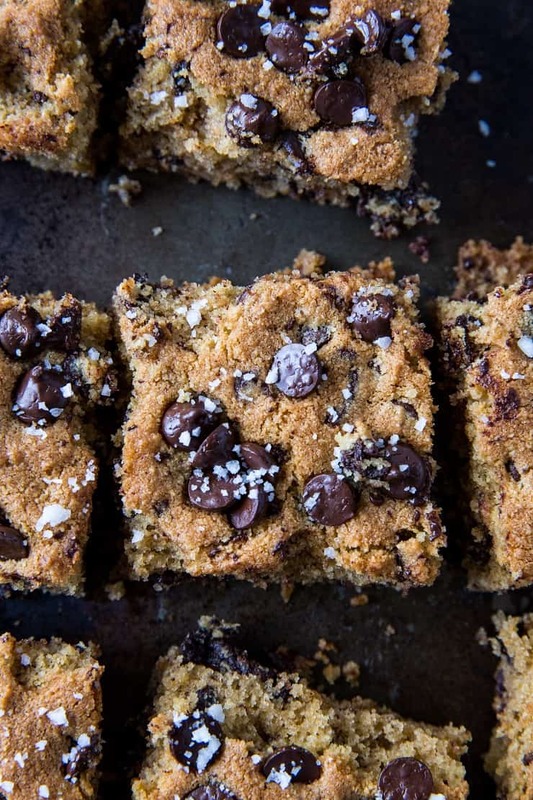 over the holidays, these cookie bars are a great one to add to the mix. I recommend you bake them up in advance so that they have plenty of time to set up after baking – this will ensure the bars hold together well rather than being crumbly (which is what happens if the bars don’t rest long enough). 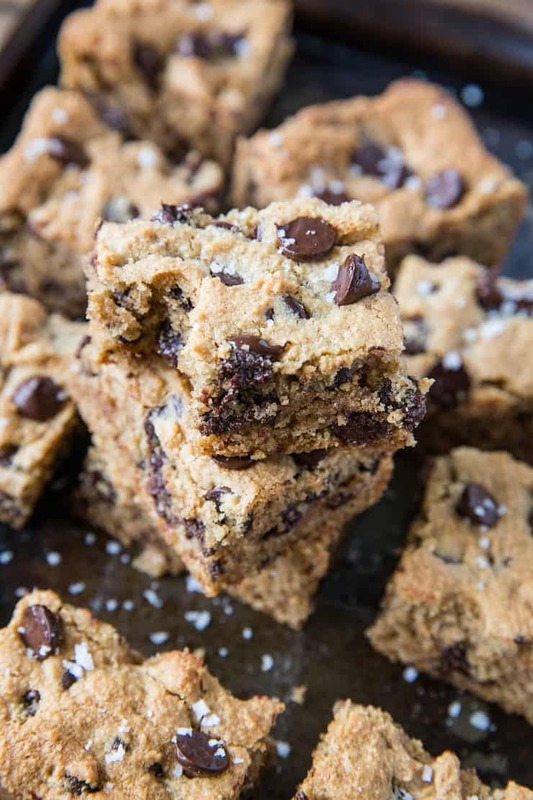 Paleo chocolate chip cookie bars for president! Preheat the oven to 350 degrees F and line an 8" x 8" baking pan with parchment paper. In a stand mixer, cream together the ghee and pure maple syrup until well-combined. Mix in the egg and the vanilla extract just until combined. In a separate bowl, stir together the dry ingredients (almond flour through sea salt) until combined. Pour the dry ingredients into the mixer with the wet ingredients and beat until combined. Beat in the chocolate chips. Transfer all of the cookie dough to the parchment-lined pan and smooth into an even layer. Bake on the center rack of the preheated oven 20 to 30 minutes, until bars are golden-brown around the edges and reach desired done-ness. For gooey bars, bake 20 to 25 minutes. For firmer bars, bake 25 to 30 minutes. Remove from oven and allow bars to cool at least 30 minutes before cutting and serving. If desired, sprinkle the bars with coarse sea salt.